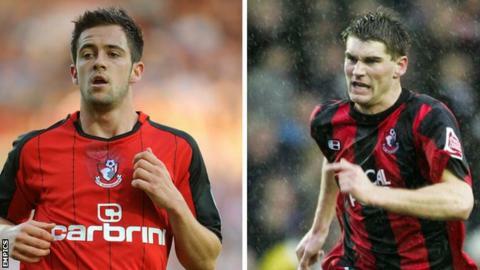 Bournemouth have defended their academy set-up after a study found their senior squad has no "club-trained" players. Research among Premier League clubs found that none of Eddie Howe's squad spent at least three seasons at the club between the ages 15 and 21. But it does not account for players out on loan or who play in cup games. "Each club individually has their strategy behind what they're trying to do," Bournemouth academy director Joe Roach told BBC Radio Solent. The CIES Football Observatory study found the percentage of club-trained players in Premier League squads has reached a new low. Only 11.7% of top-flight players graduated from their club's academy, down from 13.8% last year. Author Raffaele Poli said clubs are "increasingly reluctant" to give chances to academy players. However, Roach pointed to Bournemouth's track-record for giving players like Danny Ings and Sam Vokes their senior debuts, at 18 and 17 respectively, when the club were in League One. "I don't think there's a void of players out there that have not got the capability," he added. "But obviously they have got to be given their opportunity. "It's a simple statement, but probably the hardest one to put in place." Swansea were the only other Premier League club found to have no club-trained players in the CIES study, while Tottenham have the largest percentage at 32%. "I think we're moving forward at the right pace at the moment," Roach said of Bournemouth. "I'm pleased, at this stage of a Premier League season, we've had academy lads involved in League Cup games and who've travelled with the first-team on away Premier League games. "That's given them the opportunity to see what goes on inside the team and hopefully in training they up their levels to compete with what's required."